Find places to stay in Milpitas, CA and other fun things to do. View our list of attractions, activities, events, restaurants and visitor information. The Executive Inn provides guests with a daily continental breakfast and is within 5 minutes' drive of the Great Mall of the Bay Area. San Jose Airport and California's Great America theme park are 11 km away. Free Internet, Non Smoking Rooms. Offering all-suite accommodations with kitchens and separate living areas the pet-friendly Extended Stay America - San Jose - Milpitas is a convenient choice for our guests looking for the comforts of home close to major Silicon Valley attractions. Free Internet, Free Breakfast, Pets Allowed, Non Smoking Rooms. With easy access to freeways and shopping and all-suite accommodations with kitchens the non-smoking Extended Stay America San Jose - Milpitas - McCarthy Ranch is an affordable extended-stay choice for our guests staying in the Silicon Valley area. Free Internet, Free Breakfast, Pets Allowed, Non Smoking Rooms. Currently as low as $103.13/night! Boasting easy interstate access and proximity to major corporations free hot breakfast free internet and an outdoor pool the Hampton Inn Milpitas is a convenient and wallet-friendly stay for our guests visiting Silicon Valley. Free Internet,Outdoor Pool, Non Smoking Rooms. Currently as low as $109.49/night! With easy access to freeways shopping and restaurants complimentary Wi-Fi and outdoor pool the well-priced Heritage Inn Milpitas offers our guests a convenient stay close to many Silicon Valley attractions. Free Internet,Outdoor Pool, Free Breakfast. With amenities like free Wi-Fi an outdoor pool and an on-site restaurant and convenience store the non-smoking Hilton Garden Inn San Jose/Milpitas is one of the most popular area hotels among our guests. Free Internet, Swimming Pool,Outdoor Pool, Non Smoking Rooms. Currently as low as $151.05/night! Holiday Inn Hotel & Suites Silicon Valley - Milpitas is set in Milpitas. The property is located 3.7 km from The Great Mall.The nearest airport is Mineta San Jose International Airport 9 km from the property. Pets Allowed. Currently as low as $328.00/night! 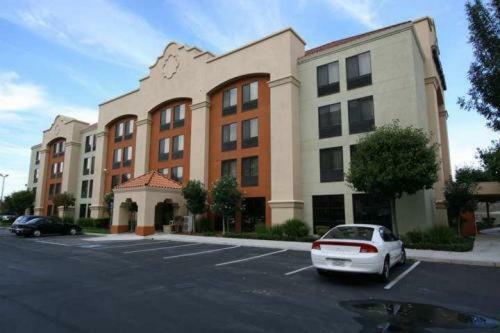 Located 500 metres from The Great Mall Minty Milpitas offers accommodation in Milpitas. This holiday home provides an outdoor pool and free WiFi. Free private parking is available on site.There is a dining area and a kitchen complete with a dishwasher and an oven. Free Internet,Outdoor Pool, Pets Allowed, Non Smoking Rooms.